Colourful chimes produce a full octave of notes. Wheels and a handle let children use it as a fun pull toy. Styles and colours may vary…. Knock out a tune on the Little Tikes Tap a Tune Xylophone.Tots need no encouragement to make noise with this colourful musical instrument for toddlers.Using the attachment to tap (or bang wildly) on the chimes produces a full octave of tones, perfect for:Encouraging an early interest in musicExperimenting with different soundsThis toy xylophone is made from durable, high-quality materials, comes with a music sheet, and can be taken anywhere thanks to its wheels and pull-along handle.Perfect for children aged two and up. 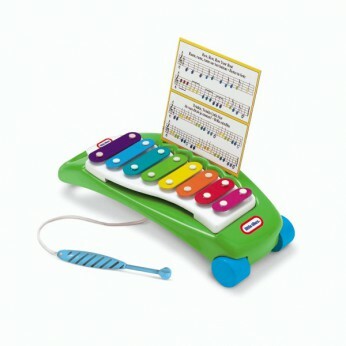 This toy costs approximately £9.99 (for the latest and best prices make sure you check our retailer list for the Little Tikes Tap A Tune Xylophone above). In our review of Little Tikes Tap A Tune Xylophone we classed it as being suitable for ages 1 to 3 years, 3 years, 4 years but recommend you check the manufacturer specific advice before purchasing.